The kitchen is the heart of most homes. It’s where you head for coffee or tea first thing in the morning, the room where weekday and holiday meals are created, and oftentimes the spot for late night snacking. You want to feel at home in your kitchen, so the kitchen cabinet style should match your personality and your home style too. Kitchens should be both functional and beautiful. And regardless of your decor, there’s at least one right cabinet style to fit your home. (Read: Kitchen Remodel in 100 Year Old Victorian) Here are some of the most common kitchen cabinet styles, and what makes each of them special. Contemporary-style homes may opt for a decor that’s sleek and streamlined. Ornamentation is minimal, and lines are clean and well defined. The right kitchen cabinets and built-ins for a modern home follow similar rules as those for the rest of the house. 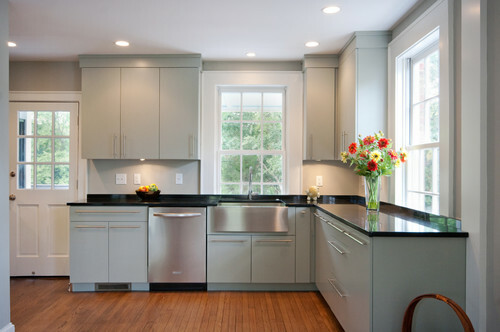 In a sleek kitchen where cabinet trim is either minimal or nonexistent, materials couldn’t be more important. Without fancy moldings, the grain of the wood, or the painted or lacquered finish, should be perfect. This style of cabinet usually has full overlay doors. This means the doors and drawer fronts completely cover the face of the cabinet and hinges are fully hidden, which accentuates the clean look of a contemporary kitchen. 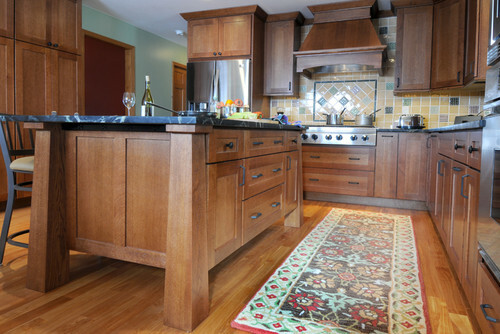 A more traditional kitchen often has paneled cabinet doors, and may have lots of trim. There are many different doors and drawers, making it challenging to pick your kitchen cabinet style. Here is a country traditional look in the popular Tuscan style. Partial overlay or inset cabinet style – leaves some of the cabinet face visible around the doors, and hinges may or may not be partly visible. Inset cabinet doors – are carefully crafted to fit inside the frame of the cabinet, making the doors flush with the cabinet face and leaving hinges visible. 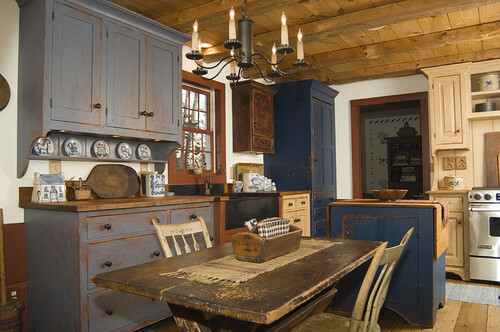 Shaker style cabinetry is somewhat traditional, in that it features a paneled front. But the style is so simple, it lends itself as easily to casual living as it does to a home with a more contemporary look. The most common way to identify Shaker style is by its single band of flat trim surrounding the cabinet door face. As with a flat-front style, the lack of fancy trim means the wood grain or painted finish is prominent. Shaker style furniture and cabinetry is named for a religious group known for, among other things, crafting beautiful, simple furnishings. To stay authentic to the style, you'll want to choose simple pulls and handles instead of fancy ones. Eclectic, rustic decor remains popular because of the many different ways it can be interpreted. 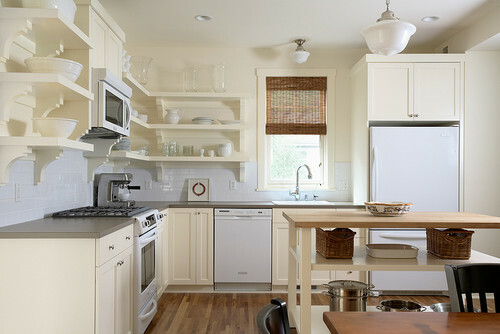 For many, this means an eclectic kitchen that might even have pleasantly mismatched or primitive-looking cabinetry. A casually eclectic kitchen can have the appearance of cupboards that have been collected over time. The cabinets themselves might complement each other without matching identically, or the cabinets might be the same, but with some finished in different colors. Another way to get an eclectic look similar to this is by simply painting base cabinets a different color from the upper cabinets. For aesthetics, it’s generally a good idea for the heavier base cabinets to be darker, and smaller upper cabinets to be lighter. Kitchens with open upper cabinets, meaning no doors, or those with shelves instead of upper cabinets can have a light, airy feel. This is great for a smaller kitchens, but it’s a tricky look to pull off. Everything is on display. If you have a collection of beautiful dishes and glassware, the open look could be great for casual living. But even if you have as many mismatched plastic cups you’d rather hide as pretty bowls you’d like to show off, you can still pull it off by having one or two upper cabinets with doors. You can transform existing upper cabinets to open ones by removing the doors and filling the hinge screw holes with wood filler. You’ll need to touch up paint or stain after the wood filler dries. 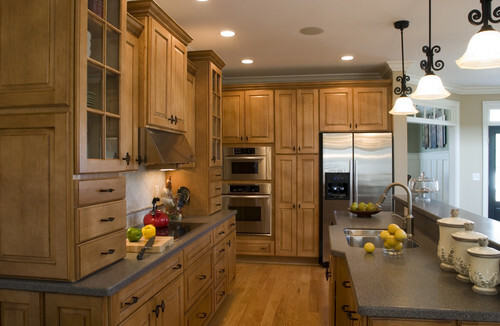 Choosing kitchen cabinets, and the built-ins that complement them, is a big job. (Read: A Kitchen Remodel Takes how Long?) It’s also a big investment. Even the simplest stock cabinets for a small kitchen cost several thousand dollars installed. It’s important to get the look right because cabinets become a reasonably permanent fixture of the home. Asses your general decorating style, or the one you’re trying to develop, and let that be your guide. Thinking about new kitchen cabinets and built ins for your home? We've collected lots of great kitchen ideas on Pinterest and we’d love to hear about which style appeals to you! My fiance and I are wanting to remodel our kitchen and need to find the right cabinets for us. Thank you for suggesting that the style is very important. I’ll have to look into finding the best company in our area. I want to do a kitchen remodel this upcoming spring. I want to get some new cabinets. It is good to know that there are a few different types of doors for cabinets. From your description, I think I would want to have a partial overlay. Penelope, Cabinet style is a very personal decision although I can tell you that partial overlay is cheaper & a better solution if you’ve got a tight budget. I have been looking at kitchen cabinets for my home and am a little stumped on the style I would pick if I bought new ones. The sleek, modern style that you provided is very cute and I like that the hinges are hidden which gives the cabinets their sleek look. These were very helpful samples of style, I will consider these as I continue to make my decision.